You can't just add stuff to a drive forever, be it your main hard drive, the little flash drive in your pocket, or the giant external hard drive on your desk. Even an arguably humongous 16 TB hard disk has a limit: 16 TB! As crazy as it sounds, it, too, can fill up. True, it'll take two million high quality photos to do it, but "only" about 150 feature-length 4K movies. Regardless, you get the idea — you may need to check the free space on a drive from time to time, especially if it starts to slow down or act funny, which is very often the not-so-clear consequence of too much stuff in a single place. Unfortunately, especially in Windows operating systems, you don't get a friendly "Hey, your hard drive is almost full!" warning. Instead, you get strange behavior, cryptic error messages, or serious problems like BSODs. Fortunately, it's super easy to check how much free space you have on any of your drives, and it only takes a minute or two. In Windows 8 or Windows 10, search for this pc and then tap or click This PC. In Windows 7 or Windows Vista, click the Start button, followed by Computer. In Windows XP, click Start and then My Computer. See What Version of Windows Do I Have? if you're not sure which you're using. 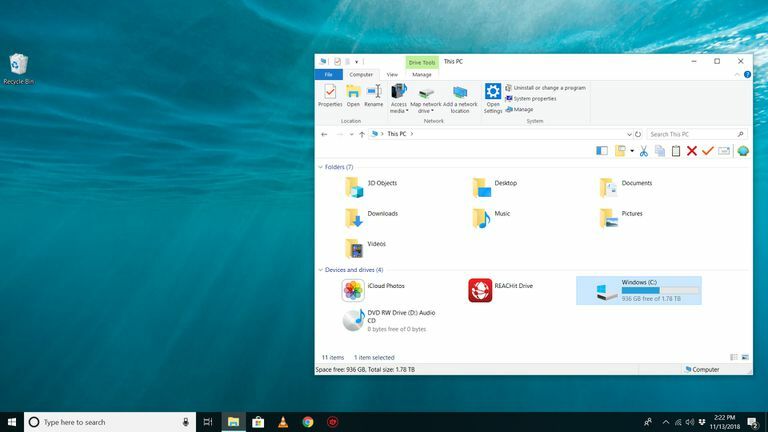 On the left-hand side of File Explorer or Windows Explorer (depending on your version of Windows), make sure This PC, Computer, or My Computer is selected (again, based on your version of Windows). If you don't see anything on the left side of this screen, open the View menu and enable the Navigation pane. In older versions of Windows, go instead to Organize > Layout > Navigation Pane (7 and Vista), or View > Explorer Bar > Folders (XP). On the right-hand side, find the drive on which you want to know how much free space is left. In Windows 10 & 8, all storage devices are listed in the Devices and drives area. In Windows 7, Vista, and XP, Hard Disk Drives and Devices with Removable Storage are listed separately. To see more, right-click or tap-and-hold on the drive you want more storage space information on, and then choose Properties. Used space: This is the sum total of every piece of data on this device. Free space: This is the difference in the total formatted capacity of the device and the sum total of every piece of data being stored on it. This number indicates how much more storage you're allowed to fill. Capacity: This is the total formatted capacity of the drive. Also there is a pie graph, showing used vs free space on the drive, helpful for visualizing how much space you're using on this hard drive or other device. You should now know exactly how much hard drive space is available on your computer. If you're running low, delete files you don't need or move them to a different hard drive that has more free space. Microsoft has historically recommended that, to avoid problems, you should leave at least 100 MB of free space on whatever drive you have Windows installed to. However, because we've seen problems at levels higher than 100 MB, we have always recommended 10% free space instead. To calculate this, just take the number next to Capacity from Step 6 and move the decimal to the left one space. For example, if the hard drive you're viewing has a total capacity of 80.0 GB, moving the decimal one space to the left makes it 8.0 GB, meaning that you shouldn't let the free space drop below that for that particular device. In Windows 10, much more detail about what sorts of files are using up your drive's capacity can be found in Settings > System > Storage. Just choose a drive you're interested in and Windows will analyze it, breaking it down into categories like "System & reserved," "Temporary files," "Apps & games," "Pictures," and more. There are also several free disk space analyzer tools you can download for Windows 10 and older versions of Windows, that'll show you which files and folders are occupying the most space. In any version of Windows, choosing Disk Cleanup from the drive's properties (Step 6 above) will start the Disk Cleanup utility, a one-stop-shop for removing files that are no longer needed by Windows.